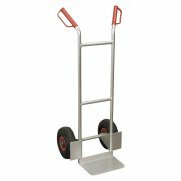 Lightweight aluminium frame weighs only 7kg yet has a carry capacity of 90kg. 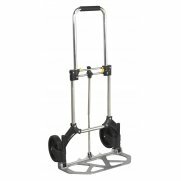 Folding steel foot plate and telescopic handle with spring release means that trolley can be packed away in seconds. Large back support makes light work of oversized loads. 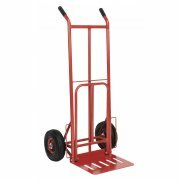 Fitted with dia.150mm wheels for easy-rolling over rough ground. 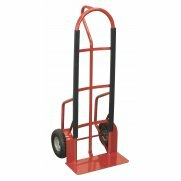 Ideal for business and home use. 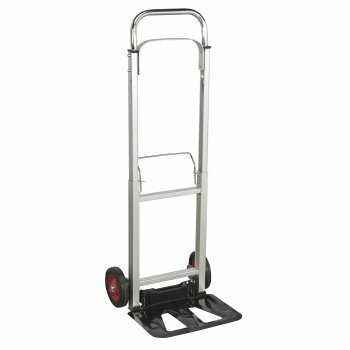 Warranty: 1 YearLightweight aluminium frame, weighs only 7kg yet has a carrying capacity of 90kg. 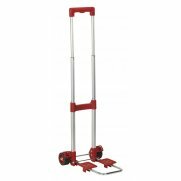 Folding steel foot plate and telescopic handle with spring release means that trolley can be packed away in seconds. Large back support makes light work of oversized loads. 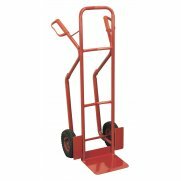 Fitted with dia.150mm wheels for easy-rolling over rough ground. Ideal for business and home use.